Bag up in small portions and add your coconut flakes. Admire and share your “hard” work. This took all of about 5 minutes, including taking the photos. So order some up, or head to your local health food store that has bins, and mix and match your favorite super foods. You can bring these to work, keep some baggies in your car, put one in your purse, or hand it to a hungry friend trying to be healthier! No more excuses of running to the vending machine for chips, crackers, or candy. You’ve got a healthy snack right in your purse or desk. Figure out your favorite versions of each category and incorporate them into your meals. Click on the pyramid, read the “Reference: Thrive Staple Foods,” and get your health into a better situation today. Throw out or donate all the junk food in your house. Organize your cupboards with healthy foods so that it’s a joy to enter the kitchen and eat healthy, not a hassle or hard task. Make your shelves look pretty by putting brown rice, nuts, seeds, and dried fruit in big, glass, mason jars. (You can get them at Wal-Mart for cheap!) Wouldn’t you love your kitchen to look more like a cooking show than a pre-packaged mess? It’s important to stay hydrated through out the day. Every action your body does, from digesting food to cleaning your blood, requires water. Without a proper amount, you will feel fatigued, hungry, and uninspired. I like to keep a big bottle of fruit-flavored water or herbal tea around at all times. I suggest frozen blueberries, strawberries, raspberries, peaches, and mango. You can also place a tea bag in, like a green tea or yerba mate. (Just take off the string and paper part if it has one.) Fresh lemon is best, but if you don’t have local organic ones around, buy a bottle of organic lemon juice and keep it in your fridge. Ginger root is sold at most grocery stores, so go pick one up and start grating! Do you tend to get the ones with more candy or healthier stuff? How do you stay hydrated through out the day? Looks great! 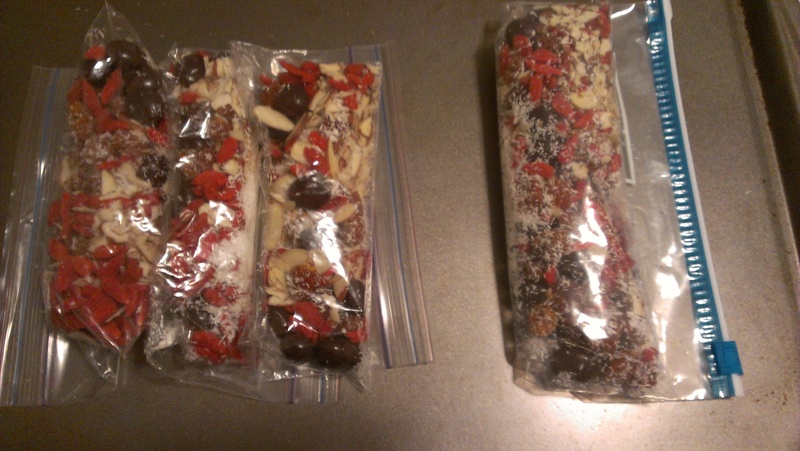 I used the Thrive Forward table to mix up some almonds, walnuts, goji berries, and cocoa nibs and I’ve been enjoying that mix the last few days. I tend to prefer healthy trail mixes. I stay hydrated throughout the day with plain water and herbal tea – I keep a mug of each at my desk at work. I can’t control it, but if you go into your wordpress account, and click on “Subscriptions Delivery” you should be able to edit it! Cheers!